Posted on June 16, 2015 by Eric Zuesse. Russian intelligence had, even earlier than Ukrainian President Viktor Yanukovych’s decision on 20 November 2013 to decline membership in the EU, gotten wind of the Obama Administration’s preparations ever since the Spring of 2013, to overthrow the neutralist Yanukovych and replace him with a racist-fascist anti-Russian regime in next-door Ukraine: a bunch of nazis who are Russian-hating fascists even more than they are Jew-hating fascists. They hate the Russian people. What nation wants a rabidly hostile regime like that on its doorstep? Consequently, within even less than a month after the American coup, Russia prevented America’s planned follow-on takeover of Russia’s main naval base, which is on the then-Ukrainian island of Crimea. The Soviet dictator Nikita Khruschev had donated Crimea to Ukraine in 1954, though Crimea had always been part of Russia; and Russia’s President Vladimir Putin provided, immediately after the coup, Russian protection to Crimeans, so that they could hold their own vote on whether to rejoin with Russia. Even the hard-like anti-Russian Forbes magazine commentator, Kenneth Rapoza, headlined on 20 March 2015, “One Year After Russia Annexed Crimea, Locals Prefer Moscow To Kiev,” and he reviewed several polls, some taken by U.S.-owned polling organizations, all showing almost 100% support among Crimeans for the switch back to being Russians again and no longer being subject to rule from Kiev — especially not this Russia-hating Kiev regime. Rapoza concluded simply, “At some point, the West will have to recognize Crimea’s right to self rule.” But U.S. President Obama, and his followers within the European Union, still refuse to do that. 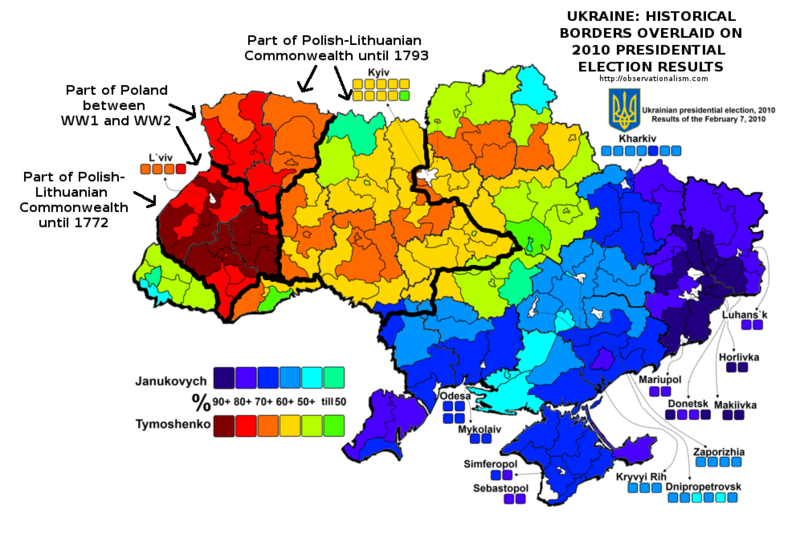 The people of Scotland are allowed to vote on whether to secede from the UK, but the people of Crimea (who never self-identified as Ukrainians nearly to the extent they self-identified as Russians) cannot do likewise? That’s what the West’s hypocritical leaders are saying — and now a World War III could result from it. So, Obama and the EU slapped economic sanctions on Russia (for what are actually the consequences of America’s coup); and, when the new Ukrainian Government started a bombing campaign to eliminate the inhabitants in the Donbass region of Ukraine, which had voted over 90% for Viktor Yanukovych (which is the only way to get Obama’s regime-change in Ukraine to survive future elections — i.e., to get rid of the voters there) the West then blamed Russia for assisting the residents in the Donbass region to defend themselves against the exterminationist invasion from Kiev. And President Obama still insists that Ukraine seize back both Donbass and Crimea. And this brings us to today, and, perhaps, to the brink of a U.S.-Russian war. This entry was posted in Business / Economics, Energy / Environment, General, Media, Politics / World News, propaganda and tagged Deep State, fascism, income inequality, neofeudalism, New Nobility, nuclear war, Obama, propaganda, Putin, Russia, U.S. dollar, Ukraine, Wall Street, War, wealth inequality. Bookmark the permalink.